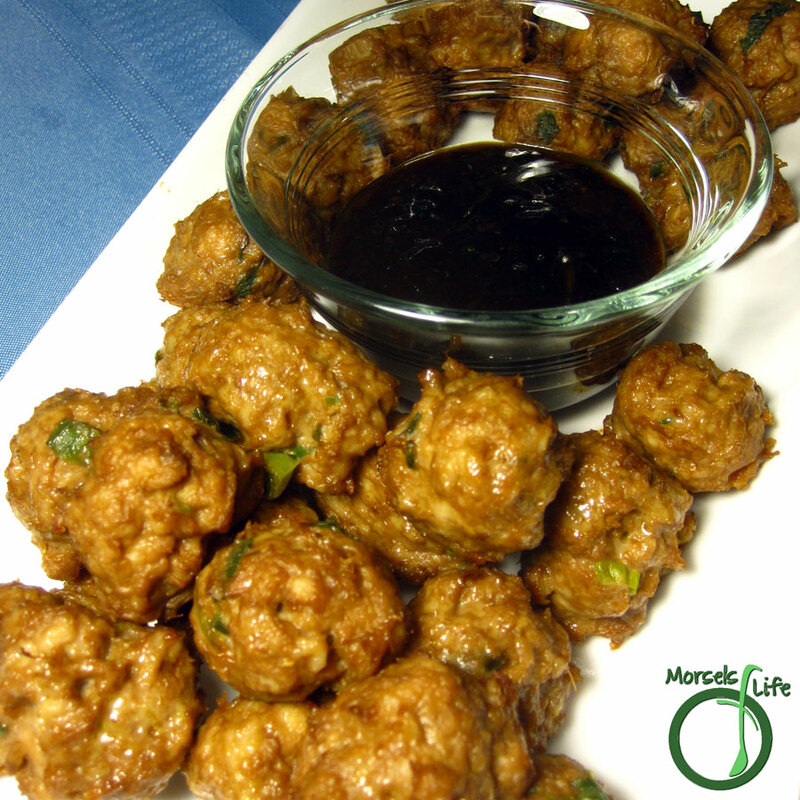 Asian-inspired, flavor-loaded meatballs with scallions, ginger, and sesame oil in a Hoisin based sauce. At the risk of exposing myself as a n00b, I'll admit I've never made meatballs before. Then I saw this recipe on Healthy Seasonal Recipes and thought it time to remedy that! Now, onto my first homemade meatballs. Totally not as complicated or difficult as I'd built up making meatballs from scratch to being in my mind. I mean, all you're really doing is making a wonderfully tasty mixture, shaping, and then baking. Even forming the meatballs isn't hard. Granted, I used a cookie scoop, but two spoons or even your hands are perfectly good options. An ice cream scoop could also work, especially for a smaller lion's head meatball. Anyway, meatballs - seriously easy to make! Just mix all the materials and bake. 15 minutes at 400F and onto the table they go! I used a basic roasting rack to let the oil drain away, but a regular tray works too (or even a cooling rack on a baking tray). Don't you just love the flexibility? Not only do meatballs provide cooking flexibility, but also eating flexibility! Make and eat them now, freeze for later, use in pot stickers, serve as appetizers, make a meal with some noodles - the options are endless! How do you plan on enjoying these meatballs? 1 teaspoon red chili pepper flakes I used gochugaru. 1 pound ground meat I used chicken. Mix all materials except Hoisin sauce, cilantro, lime, and sesame seeds until roughly uniform. Form meatballs and place on baking tray. Bake at 400F until cooked through, approximately 15 minutes. Larger meatballs will take longer. Meanwhile, combine the Hoisin sauce, cilantro, and lime. We used the Hoisin cilantro sauce as a dipping sauce, but you could also go ahead and coat the meatballs with the sauce. Shared with: Wonderful Wednesday, Wednesday Showcase, What's Cookin' Wednesday, Happiness is Homemade, What's for Dinner? Sunday, Melt in Your Mouth Monday, Over the Moon, What'd You Do This Weekend? I am a huge meatball fan and, as a consequence, am always looking for a new way to make them. This recipe looks like it will fill the bill quite nicely. Thanks. They look delicious! I have to say, that meatballs aren't my favorite thing to make, but usually because I don't feel like making the effort! Thanks for sharing at MTM! A cookie scooper is what I use for my meatballs - so much easier! These look great! I'm all for making things easier and more efficient! :) Hope you like them. What a great combination of flavors. The sesame seed oil is something I always have in my pantry. I bet these would be great with ground turkey also! Thanks for sharing! I love the flavor of hoisin - Thanks for sharing on the What's for Dinner link up! This reminds me I need to get the ingredients for tomorrow. Pinned for later. Thanks for sharing at #OverTheMoon!